Sponsored by CST Covers Industries, Inc. Discuss the efficiency of using lightweight, recyclable aluminum in clear-span structures by eliminating secondary structural members. Compare how aluminum is an efficient, waste reducing alternative to steel in overhead, sloped and vertical applications. Avoid maintenance and life cycle costs by specifying a product that is durable and resists corrosion. Explore case studies of geometric structural designs used for lattice and spaceframe aluminum structures that have received green building certifications. Summarize the commitment by the aluminum industry to improve industry energy consumption, lower emissions, minimize land resource use and maximize sustainability. Lamella geometries allow for the design of very large structures minimizing the amount of material necessary for the forms. 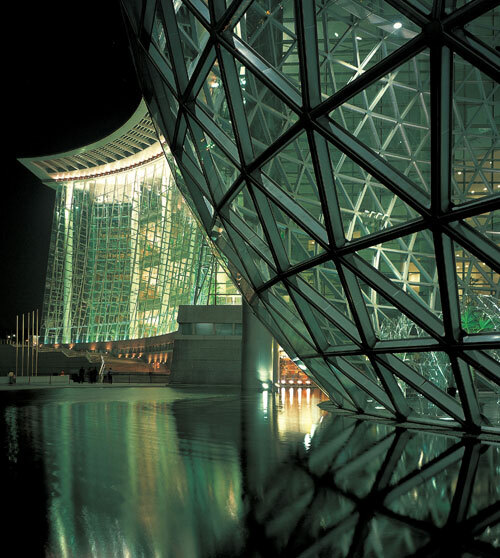 The properties of aluminum made this large structure possible as the focal point for the Shanghai Scienceland Museum. Latticed, tubed, segmented, half-domed, the promise of spatial geometries that emulated nature began well before Buckminster Fuller popularized one of the first geodesic domes, a spaceframe, a half century ago. Today’s architects are continuing to explore geometric forms and are finding that aluminum is a material that meets both structural as well as sustainable goals. “I‘ve never met an architect who doesn’t love geometry,” spoke Grace Ferretti, Manager of Architectural Division of CST Covers when discussing the sustainability of using aluminum for long span structures and spaceframes. Technology and computers are allowing architects freedom to span ever larger areas with more efficient structural components. Virtually any shape or form can be designed using an aluminum structural or spaceframe system. The only limitation is the designer’s imagination. Aluminum is strong, lightweight and a resilient material. It combines strength with flexibility and can flex under loads or spring back from the shock of an impact. Around the world aluminum is becoming the choice for long span structures over steel frames for many reasons including the many environmental benefits of its materials footprint. This article will explore the uses of aluminum in long span structures and spaceframes. It will also review the latest research by the Aluminum Association on the sustainability of aluminum from mining to recycling. This industry is committed to improve industry energy consumption, lower emissions, minimize land resource use and maximize sustainability. The projects highlighted in this article include projects that range from the largest Platinum LEED®-NC campus to the newest aluminum solar “trees” to be planted in parking lots as a high tech energy and water collection system. Sustainability has many aspects and design professionals are working to improve the cost to the environment with better material choices. The international and national aluminum industry is helping this movement by providing research on the sustainability of aluminum from mining to manufacturing. From documenting recycled content to initiating a soon to be released life-cycle analysis the Aluminum industry is becoming a leader in sustainable mining and manufacturing processes. The benefits of aluminum as an environmental choice are based on its intrinsic properties as an alloy that maintains strength. Social, economic and environmental goals are three principle goals for sustainability. As discussed later in this article, the international community is providing incentives for mining practices that promote best practices around the world. Environmentally, aluminum has a high recycled content and can be recycled. Aluminum is durable and long lasting. Aluminum meets economic goals because of its higher strength-to- weight ratio than most other metals or materials. Aluminum is one of the most efficient structural materials providing the same strength than steel at less than one-third the weight. This reduces the project material costs associated transportation costs and reduces the overall costs through the adaptation of a multitude of installation methodologies. Design professionals who choose this building material will be able to achieve many of their goals for sustainable buildings. “There is recycled content in almost all aluminum products” according to Charles Johnson VP, EH&S of the Aluminum Association. Aluminum that was produced and recycled in the last century is still in use in buildings, containers and automobiles. In 2008, a survey of all aluminum producers indicated that the “total recycled content of domestically produced, flat rolled products for the building and construction market was approximately 85 percent. This industry survey of aluminum producers also indicated that on average, approximately sixty percent of the total product content is from post-consumer sources.”1 Individual producers may have higher post-consumer totals and total recycled content of the material is available for use with green building credits. The composite of recycled and new aluminum has grown to be averaged at almost seventy-five percent recycled content in all aluminum products. Architects calculating USGBC LEED® certification points can count on obtaining at least one if not more points for recycled content, Material and Resources Credit MR 4.1 and 4.2. If the value of the recycled content is at least ten percent of the cost of the materials, the project will earn one LEED® point. If the recycled material value reaches twenty percent, it will earn another point. Aluminum extruders are currently producing materials with a seventy percent recycled content or greater and most fabricators should be able to provide documentation as required for green rating systems. The recycled content depends on where and when the raw materials are available. An aluminum product that is manufactured to a specific strength when recycled maintains its properties and can be reused again for structural purposes. Aluminum is sustainable in that it can both be recycled and re-used without any loss of strength. The market for aluminum, particularly recycled aluminum is booming and the aluminum industry is encouraging product designers to think about disassembly of components while designing for structural assembly of new buildings. Aluminum is very long lasting as a durable material as it is non-corrosive and will not degrade due to moisture, condensation, rust or salt-ladened air. The aluminum industry is currently developing an extensive study of life-cycle costs to document the longevity of aluminum as a sustainable product in any climate and for most products. 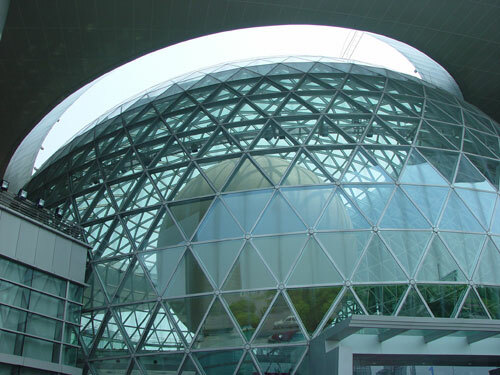 The Shanghai Scienceland Museum's egg-shaped atrium is constructed of sustainable, structural aluminum with recycled content.